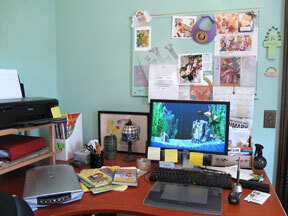 What is your writing workspace like? 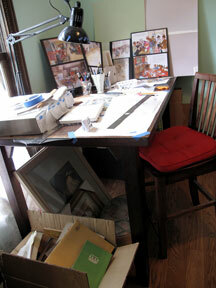 It is all you’ve ever wanted, or is it a cramped workspace in the corner of an already crowded den or family room? Perhaps it’s the kitchen table or a small desk in your bedroom. If you are a Christian and God has called you to write, even if your workspace doesn’t seem “ideal”—He will provide the workspace that’s HE knows is right for you. In my case He chose a most unusual and unexpected first workspace…a Sealy Posturepedic. My bed. In the early 1990’s I was bedridden with a mysterious illness. The pain was excruciating at times. My cognitive abilities were impaired as I went in and out of a mental fog. For seven weeks I was for the most part, bedridden. The exhaustion was overwhelming. My parents graciously cared for our two young sons during the day until my husband came home… while I made a major dent in our mattress. It was during that time that I felt an intimacy with God unlike I had ever experienced. I read the Psalms for comfort and spiritual strength. Thoughts of how God had comforted me throughout my life filled me with an overwhelming passion to write a book…a book on the Psalms for children. Was this mental fog clouding my judgment? I had never written a book before. Was I crazy? Write a book from bed? My writing supplies consisted of pens, legal pads, and every version of the Bible my family could spread out over the covers—my “desk”. I pulled myself up, leaned against pillows, and wrote my first book from the workspace that God had chosen for me. Alone in that quiet room, I heard that still small voice in my heart urging me to write. Dear Christian writer, is your writing workspace less than ideal? If it is, do not be discouraged. Is it the kitchen table? A little corner in your dining or living room? Is it your bedroom, or even your bed? No matter. If He has called you to write…you will! Today, I have my own office. I have a comfortable chair, a good computer, a large window, a nice desk, file cabinets, stuffed bookshelves, and a paper tiger! It’s a blessing to have this office, but I have to say that my first workspace holds the dearest memories…and as I look up at a framed book cover of Psalms for a Child’s Heart on my office wall, I’m reminded why. Why would they do such a dastardly thing to a poor writer? Don’t they realize I love all of them equally and wouldn’t dream of throwing them away? You would think that kind of loyalty would prompt better behavior. Maybe I’ll just clean them all out and start over. That should show them who’s boss. Of course, I get sick thinking about having to start all over accumulating all that information. They have me over a barrel and they know it! I guess the only thing I can do is move out and let them have the office. I can always work at the library. Just let them try to follow me there. Our librarian won’t tolerate such behavior. Hummm. Maybe I’ll set up an office at the library.